Professional Airbrush Valet Service - Have your airbrush professionally cleaned, serviced and returned to you for £41 inc. VAT*. The Airbrush Company Ltd is proud to offer our Valet Service for your airbrush. How many of you have an airbrush in a drawer that needs cleaning and servicing? Don't let that stop you. Simply send your airbrush to us for a professional clean and service to get it ready for use like it is new again. Your airbrush will be returned to you with aftercare instructions, helping you to keep it clean and ready for action. About Us: We are family-run business with a 70 year history in airbrushes in the UK. We have extensive technical knowledge and experience, offering friendly professional support. 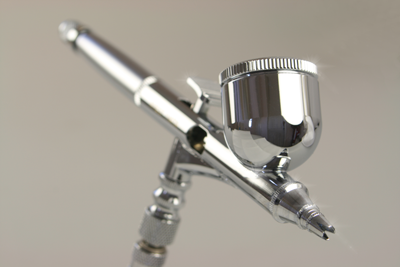 What sets Airbrushes.com apart from other companies selling airbrushes is our experience in technical support and repair service. Mike Vose is our full-time technician who has years of experience in servicing and repairing airbrushes and compressors. We stock all spare parts for all of the airbrushes and compressors that we sell, so you can be confident when purchasing an airbrush from Airbrushes.com or one of our authorised resellers. The valet details: This price does not include the cost of parts. Cost of replacement parts will be charged in addition. We only offer the valet service on brands that we sell and support (see the list below) because we may find that you also require new parts. Mike will contact you to inform if any spare parts are needed. As part of the special Valet price, your airbrush will be returned to you by Royal Mail special delivery, a secure delivery method that requires a signature upon delivery. * This charge covers UK mainland only. Surcharge applies for return carriage outside UK mainland. If you own an Iwata airbrush, you can claim 20% off your Valet Service and parts fitted at the time of the service, if you purchased from The Airbrush Company Ltd (Airbrushes.com) or you can provide proof of purchase from our authorised reseller. We provide technical support and a repair service for all of the brands of airbrushes and compressors that we stock. Oil-less piston compressors are low-maintenance. This means that you do not have to change the oil. There are situations when you would need your compressor serviced or repaired, such as accidental damage or normal wear. In particular we recommend that a compressor used for spray tanning is serviced at least once a year to keep its optimum performance. This is because our experience has shown us that many salons are using compressors at too high a pressure and without adequate ventilation. This causes tanning solution to get drawn into the compressor, clogging the filter and motor. The compressor should be situated in a source of clean, dry air away from the direction that you are spraying in. We recommend using extractors for any application where you are producing a lot of overspray. Damage to compressors caused by misuse will not be covered under warranty. Contact us by email through our Contact Us page (click here) or by telephoning +44 1903 767800. Please contact us to check that it is a model that we can service. Also we can often diagnose a technical problem over the phone and advise you how to solve it or advise you wish parts you need to order. This could save you the time and inconvenience of being without your airbrush or compressor and save the cost of sending it in. Package the item well so that it will reach us in the same condition that it leaves you. Use a strong box or strong jiffy-bag for airbrushes with plenty of padding. Use a strong box for compressors with plenty of padding and mark the box with an arrow for 'This Way Up', especially for oil-filled compressors. Send it in the original packaging if you still have it. For airbrushes, send the goods by either Royal Mail recorded delivery or special delivery. We recommend that you use a secure delivery method that requires a signature upon delivery. We also suggest that you opt for insurance cover. For compressors within the UK mainland we can arrange our courier to collect it from you. In this case we will arrange collection only when the parcel is ready to go. To arrange collection of your compressor please call us on +44 1903 767800. At this point we will need your credit/debit card details so that we can take payment for the carriage. It is your responsibility to have the parcel ready for collection and someone available at the address on the day or days agreed with Airbrushes.com. The courier cannot give appointment times, so they could collect at any time on the agreed day(s) between 9am and 5pm. The courier will still charge for missed collections, so we will add courier charges to the total service bill. We will estimate the cost for work and parts needed. If it is significantly more than our minimum charges below, then we will telephone you to authorise the work to go ahead. You make the payment before we start the work. We will telephone you for your credit/debit card payment details. In providing payment details, you are authorising us to take payment for the minimum service charge or the estimate provided. Immediately after taking the payment, we destroy the card details. We will contact you when the work is complete, or inform you if we discovered more labour or parts are required than are covered by the estimate or minimum charges. The estimate is made before any significant paid labour is spent on taking the airbrush or compressor apart, so during disassembly we may discover more parts are needed. We will never sell you replacement parts that are not necessary, and we will always seek new authorisation from you for the work and parts. We will telephone you again for card payment details for any additional items because we do not store your payment details on our systems due to data protection regulations. We will send serviced or repaired items back by our standard shipping method. The cost of carriage will have been included in the estimate total. Some service charges include the carriage to UK mainland (such as the Airbrush Valet), but a surcharge will apply for carriage to locations outside the stated area. If you need the item to arrive guaranteed before midday on the day after dispatch then you may request to upgrade the delivery method and pay the extra carriage charge. There are not many repair services like ours available in the UK, so we are constantly receiving airbrushes and compressors for service. Consequently, there is sometimes a queue for the service, which may delay the processing of your repair. We endeavour to deal with your repair as quickly as possible. However, please try to send your equipment for service at a time when you are least dependent on it - although we realise that many occasions will be emergency repairs. If you rely on your airbrush or compressor for your work then we believe it makes good business sense to invest in backup equipment. Work out the cost of being without your equipment and weigh it against the cost of buying a backup system. These are the minimum charges for service and repairs. These prices do not include the cost of parts. Cost of replacement parts will be charged in addition, unless they are covered by warranty. These prices do not include carriage, unless otherwise stated. These prices are subject to change without notice.